Graham Local Schools held a wing eating contest March 27 to raise money to support the United Way of Clark, Madison and Champaign Counties. Following the contest, the district presented a $4,346 check to the United Way. Teams that participated in the contest included students, staff, community members and a team comprised of members of the Champaign County Sheriff’s Office. 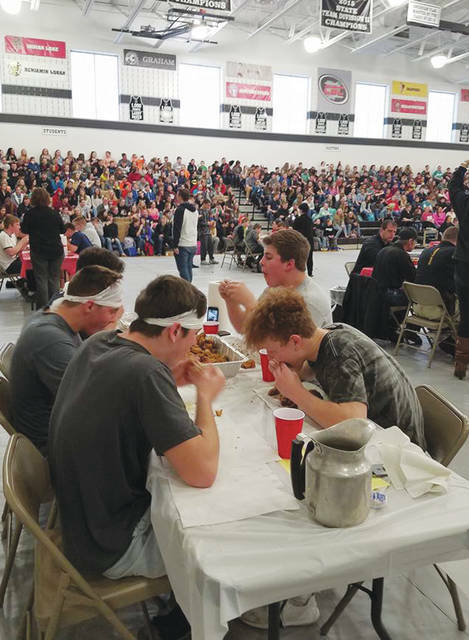 ST. PARIS – On March 27, Graham Local Schools hosted a Wing Contest in the high school gymnasium to raise money to support the United Way of Clark, Madison and Champaign Counties. Ten teams included students, staff and community members. The school district expressed appreciation to all participants, including a team from the Champaign County Sheriff’s Office. Each student raised $25 and each adult raised $125 to participate. The high school student team of Nick Moore, Alek Martin, Gannon Arnett, Brady King and Hunter Collier walked away with the victory. 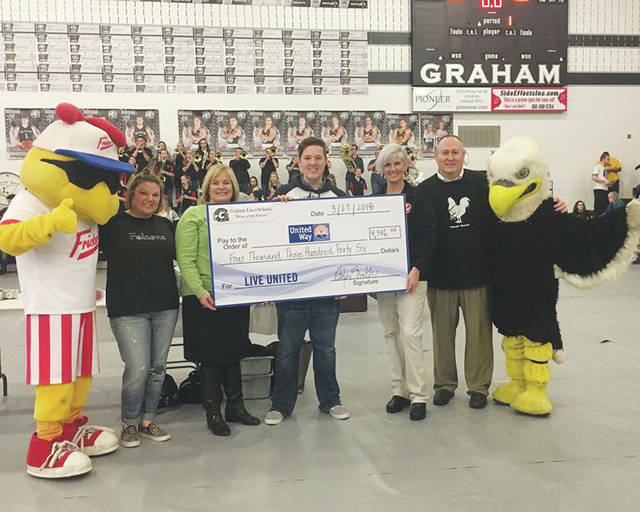 “This event was intended to raise money for the United Way, but also to show the unity that is represented throughout the Graham community,” said Emily Smith, Graham’s director of Student Services. The district built a partnership with Fricker’s through the contest. “We were excited to partner with Graham and we look forward to doing it again next year,” said Jen Lewis, Fricker’s regional manager. Following the contest, the district presented a $4,346 check to the United Way. The money donated was from the contest, as well as staff donations through the United Way Campaign. “This event was just awesome, and we can’t thank you enough,” said Kerry Pedraza, executive director of the United Way of Clark, Madison and Champaign Counties. The district plans to host another wing eating contest next year, with hopes of having more participants and raising more money. Story submitted by Emily Smith, Director of Student Services, Graham Local Schools.